Grace Jones, Is That You? MAKEOVER - TIM COBURN STYLE! 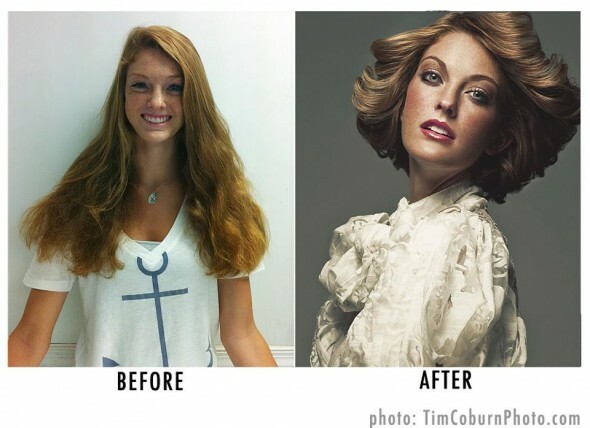 The top modeling agency in DC, The Artist Agency, came to me needing a real makeover on a cute 17 y/o girl. The owner of the agency wanted something updated for her hair and a look that would make her stand out. So of course I got my best hair and makekup talent, James Cornwell, and we went to work! Here is the before... and after! Life works in funny ways sometimes. Just before this shoot, I got off the phone with a potential intern. We were having a conversation about the type of photography he is doing now, where he wants to go and what he wants to learn. At the moment, he's shooting a lot of photojournalism for the military. We were discussing how in photojournalism, you have to be prepared for anything! You are sort of a fly on the wall, capturing what you see, as you see it, in an interesting way. But, doing what I do, a lot of the work is in the prep. Organizing models, hair, makeup, setting up the shots, lights, direction, etc. It's less about capturing the moment than it is creating it yourself. Or so I thought! I had my vision down pat! Two hard rim lights and a main light with a soft box and a grid, wide angle, dunking the ball. Simple enough. I've done this lighting setup only a thousand times. Upon arriving at the shoot I realized that the location I scouted out, didn't have power. Ok. This wasn't a big enough shoot for a generator. Not that I have one anyway. Not a huge deal. I did bring my Profoto Pro7b just in case. At least this will give me two lights on battery power. So a quick lighting change and we setup the first shot. I get a few frames taken when I look over at the Pro7b and notice it's smoking. Yes, literally smoking is pouring out of the battery pack. We wait around for a few minutes and the thing is popping and kind of... melting? Ouch, this is going to be expensive. So, we go from a 3 light setup to a no light setup... talk about unexpected. But, I have the model here and I want to get some shots, but we're loosing light, it's 7pm. I have the model run around the court just playing basketball. "Just pretend as if you are playing with the best in the world," I say. Here I am, a fly on the wall, just shooting away at what I see. It has been an extremely long time since I have shot like this. It was kind of liberating actually. The best part of the shoot was my VERY poor direction. I know little about sports and kept calling the hoop a goal and asking him what it was called when you push the ball to another play with both hands, passing? In the end only one of the shots used a flash and I got some of my favorites shots in my portfolio. I can't wait for that new intern to start... I'm sure I'll learn a lot from him. Time to go fix that battery.